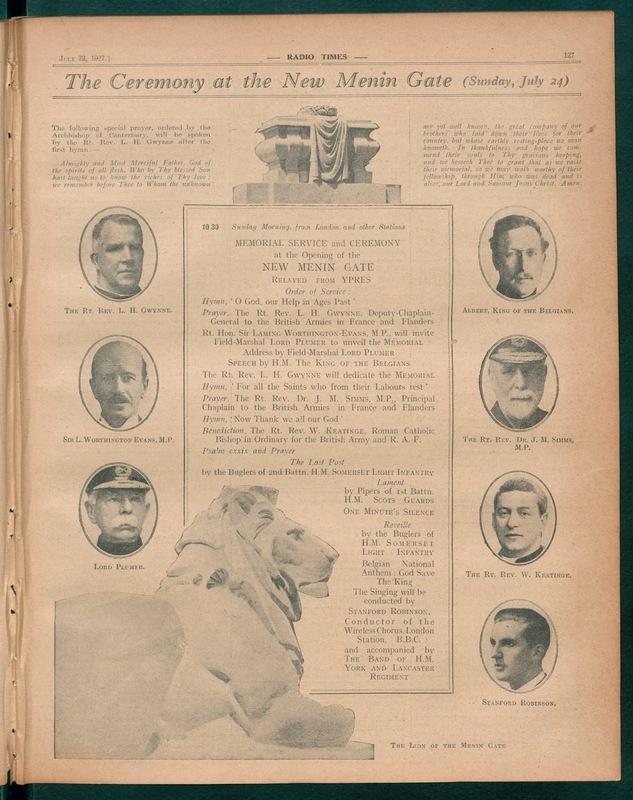 It is exactly ninety years to the day since the Menin Gate memorial to the missing was inaugurated in a ceremony attended by Albert, King of the Belgians, Lord Plumer of Messines and the British Minister of War. René Colaert, Burgomaster of Ypres, perhaps the man most intimately linked both to the memorial and the rebuilt city in which it stands, lay ill in bed within earshot of the ceremony. He was to die just a few weeks later. I should like to acquire the whole of the ruins of Ypres… a more beautiful monument than Ypres in the afternoon light can hardly be conceived. A more sacred place for the British race does not exist in the world. But there were those who regarded the ruins as little more than a monument to the efficiency of German guns, and plans to rebuild the city were soon in place. The Menin Gate – or Menin Port – leading west out of the city to the front lines and through which so many thousands of men had passed between 1914 and 1918, was chosen as the site for a grand memorial arch to commemorate the many men missing in action. Reginald Blomfield was charged with the design, and construction began in early 1923. Although not without difficulties, work continued steadily for the next four years and the monument was ready to be officially opened on Sunday 24th July 1927. British interest was, understandably, high. Thousands of pilgrims travelled to the city for the ceremony and for those unable to travel, the BBC relayed the ceremony to Britain in one of its earlier – and possibly the most innovative – outside broadcasts. Having assembled in the market square outside the Town Hall and in the shadow of the (still ruined) campanile, the inauguration party marched in procession to the gate itself. King Albert and Lord Plumer stopped en route to call on the dying Burgomaster in his room overlooking the monument. Then, at 11 o’clock, the ceremony began. After the prayers and hymns and a speech – in English – by the King of the Belgians came the moment when Plumer himself was to press the button which finally revealed the memorial plaques. But not before he had delivered – from memory – a moving speech culminating in the now famous words, ‘He is not missing, he is here’. Afterwards, the Last Post was played by the buglers of the Somerset Light Infantry – a tradition that has been maintained almost without interruption from that day to this. And so, at sundown this evening, as on every evening throughout the year, before a crowd of hundreds or for just a few, beneath the names of over 60,000 British and Empire troops, people will gather as they have every day for each of the last ninety years, to remember. Today marks the centenary of the death of the poet, medic and of course soldier, Lieutenant Colonel John McCrae, famous today as the author of that iconic verse In Flanders Fields. Born on 30 November 1872 in Ontario, Canada, McCrae graduated in medicine from the University of Toronto in 1898, subsequently working at Toronto General Hospital and at John Hopkins Hospital in Baltimore, Maryland. In 1900 he enlisted in the Canadian Field Artillery, serving in South Africa during the First and Second Boer Wars. On his return to Canada he became professor of pathology at the University of Vermont before – with the outbreak of war in August 1914 – being appointed Medical Officer to the 1st Brigade Canadian Field Artillery. By 1915 McCrae was in Flanders working as a surgeon at the Advanced Dressing Station (ADS) one the banks of the User canal just outside Ypres (where Essex Farm Cemetery now stands). It here in May that he wrote In Flanders Fields, following the death of his friend Lieutenant Alexis Helmer. 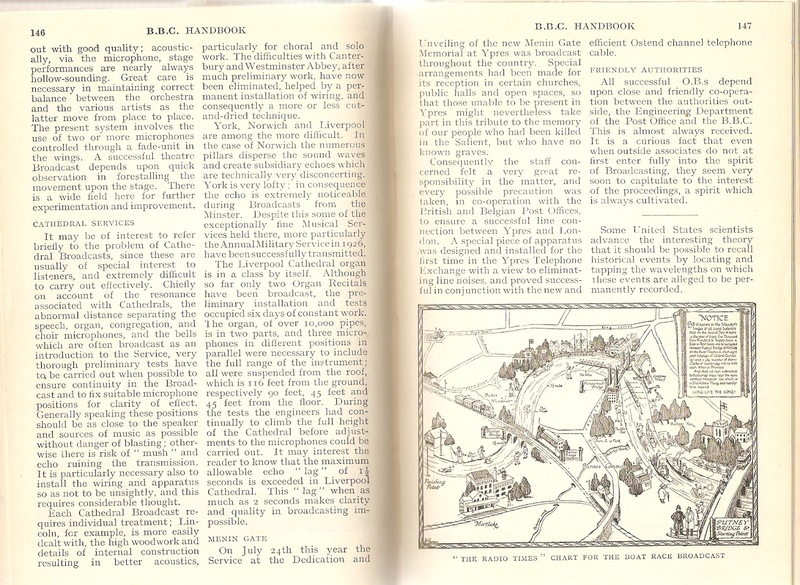 The poem was published – anonymously – in the magazine Punch in December that year 1915. It was an instant success and soon after McCrae became a household (‘if frequently misspelt’) name all over the world. McCrae was not to survive the war. He died of pneumonia on January 28th 1918 aged 45, and is buried at Wimereux Communal Cemetery near to the Canadian General Hospital near Boulogne-sur-Mer where he had been stationed since June 1915. Today, May 21st 2017 marks the centenary of the Imperial – now Commonwealth – War Graves Commission. With the Great War showing no sign of ending and the death toll mounting, burying the dead remained the responsibility of the British Army. But commemorating the ultimate sacrifice of so many men became the permanent responsibility of the new commission, whose draft constitution was approved by the King in Council on May 10th, and finally executed on May 21st 1917. 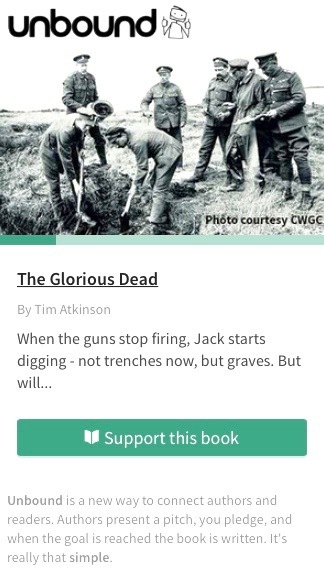 The War Graves Commission was born. But the escalating task of accurately and sensitively recording such information was only one of Ware’s problems. With the end of the war still only a distant prospect, there were administrative battles to fight within Whitehall, with the Ministry of Works which assumed it would have authority over war memorials and cemeteries. And then there was the nature of the cemeteries themselves. The decision not to erect crosses, to bury officers and men together as well as the earlier orders banning the repatriation of bodies were all to cause controversy. Throughout it all, Ware worked tirelessly to ensure that the lives of all who made the ultimate sacrifice were suitably commemorated. I think he got it right, don’t you? The story of Lawrence of Arabia is one of the Great War’s most enduring legends. It’s Indiana Jones but for real – shy archaeologist excavating crusader castles in Arabia turns guerrilla leader (on behalf of the British Empire) inspiring Arab rebels to overthrow their evil Turkish masters. The Arab revolt (which began on June 5th 1916) was a long, bitter campaign fought under a variety of commands. Lawrence himself was just one of many British and French military personnel sent to assist the revolt. His appeal seems to stem from his decision to ‘go native’. Often pictured not only wearing a keffiyeh (headdress) but also an ornate besht (gown) given to him by Prince Faisal, Lawrence – who spoke fluent Arabic – became convinced that he was genuinely advancing the cause of Arab freedom. After the war he attended the Paris Peace Conference still clinging to the belief that what he’d done would lead to Arab self-rule. But it was not to be. The Sykes-Picot agreement had already divided the spoils of the Ottoman Empire between the British and the French. Lawrence ended the war holding the rank of Lt. Colonel. But, disillusioned with the outcome at Versailles, and in an effort to withdraw from public life he re-enlisted – twice – under an assumed name, serving as either a private soldier in the army or a humble aircraftsman in the recently-formed RAF. He retired to his cottage – Clouds Hill, in Dorset – in 1935 but was killed while riding his Brough Superior motorbike a few months later, on 19th May. He was just 46. If your image of T.E.Lawrence is Peter O’Toole in dazzling white headdress, blue eyes burning, hands blood-soaked from another mass slaughter then the facts of Lawrence’s troubled post-war life and early death might be something of a disappointment. But when the legend becomes fact, print the legend as it says in The Man Who Shot Liberty Valance. And the Lawrence legend certainly lives on. Exactly 100 years ago today, the first contingent of just over 1000 Chinese labourers arrived in France. Recruited to free front-line troops for fighting, in all around 140,000 men served, helping with a variety of tasks behind-the-lines. Although they were all non-combatants, around 2,000 members of the Chinese Labour Corps died during WW1, many from disease (including the notorious ‘flu pandemic of 1918). The largest number of graves is at Noyelles-sur-Mer on the Somme. The cemetery contains 842 gravestones, all engraved with epitaphs in Chinese characters. Two stone lions – a gift from China – used to mark the entrance and now stand in the nearby village. In case you haven’t heard, Football’s world governing body has banned the England and Scotland football teams from wearing poppy armbands when they meet at Wembley in a World Cup qualifier next Friday… the 11th of November. Their objection is that the poppy could be seen as a political symbol. Such things are banned, along with any ‘commercial or religious’ endorsement on official clothing. It’s not the first time that the poppy has come in for a hammering. Indeed, initially Christian Army chaplains insisted on it being dug up from British and Commonwealth war cemeteries as a ‘heathen weed’. In the 1930s the Peace Pledge Union began distributing an alternative white poppy in protest at the tradition image’s association with ‘military power’ and the ‘justification of war’. There’s little else to say, really. It neither glorifies war, celebrates military might or takes a political stance. It’s a flower – a blood red flower – growing in abundance on the soil on which so many shed their own blood in a futile conflict. Another day of triumph for Team GB in Rio brings with it the poignant reminder that a former Olympic gold medallist in the same event was killed on the Somme 100 years ago this year. Frederick Septimus Kelly was no ordinary Olympian (if there is such a thing). Lieutenant-Commander Frederick Kelly served with distinction, seeing action first in Gallipoli where he was wounded (twice) before taking part – and ultimately being killed – in the Somme offensive. But not only was Kelly a top-class sportsman (winning gold in the 1908 London Olympics as a member of the Great Britain Men’s Eights) but he was a composer, too – a musician of immense promise and another in the roll call of artists whose legacy speaks of enormous, unfulfilled potential. Kelly is buried in Martinsart British Cemetery where – unusually – the grave markers are carved from a local red sandstone rather than the more common, white Portland stone that is so familiar. As a subject, The Somme is huge – as immense as the Thiepval monument to the 72,000 missing, men who in many cases met their deaths within minutes of the start of the slaughter, fodder for the German guns, caught on German wire, or atomised by artillery bombardments. There’s hardly any more to be said. Words fail and figures speak for themselves. Best, then, on the awful anniversary of Britain’s bloodiest battle, to perhaps do what we did on our visit to Thiepval a few weeks ago – to concentrate on someone, an individual, and to think of them, to find out a little of their lives in an attempt to make the massive massacre mean something, an attempt to better comprehend the incomprehensible. So, to mark the anniversary, I’ll be listening, playing and singing the music of this man – George Butterworth, MC. Here he is, among those ‘intolerably nameless names’ on that huge monolith. …Who was just as sloshed as Schlegel. According to Monty Python, at any rate. But Wittgenstein was also a soldier, fighting for the Austrian empire and winning Silver Medal for Valour for remaining in the open under artillery fire, studying the trajectory of enemy mortar fire and using that colossal brain of his to calculate the precise location of the Russian guns. The irony is that Wittgenstein’s former (and future) Cambridge friend and mentor, Lord Bertrand Russell, was also in action on this day – in the dock, defending himself against a charge of distributing pacifist literature. Russell won no medals although it must take courage to take such an unpopular stand. In his case, of course, he could afford the fine (£100) and his reputation was unaffected by the adverse publicity. Others weren’t so lucky. Although the Germans had secretly already offered the Allies peace terms in early 1916, the war was still popular; men were still signing their names in fits of patriotic fervour. To object to the war was to invite ridicule, abuse and much, much worse.